The need to continually think outside the square when it comes to farming has motivated a trial using green waste from the city on broadacre crops. Trucks have carried thousands of tonnes of composted food scraps, grass clippings and even nappies from the Southern Metropolitan Regional Council’s (SMRC) waste management facility at Canningvale to three Wheatbelt farms. Spearheading the trials were the Kalajzic, Mincherton and Applegate families through their farming body the Duli Group, with the help of funding from natural resource management group Wheatbelt NRM. “We’re always looking for something different to do on farm which is going to improve our land, but don’t always stick with the norm,” Mike Kalajzic said. Through a series of conversations with a contact at a Perth council, Mike Kalajzic was put in contact with a landscape supplier contracted to the SMRC. He discovered thousands of tonnes of green waste from city households were being composted, but demand for the product was small. He quickly became the first broadacre farmer to approach the supplier, with the intention of using the compost on his Cadoux farm. The composting process begins with the rubbish being manually sorted before being moved to a digester, heated to 60 degrees, where natural bacteria breaks down the material. Further turning and aeration in a controlled environment, followed by more sorting, means the compost is stored and ready for use in six weeks. Already 3000 tonnes of the compost have been spread across trial sites on the three Cadoux farms. “Instead of this rubbish going into landfill, it’s being taken out of the city and being put to good use on our farms,” Mike Kalajzic said. The cost and transport of the compost was being subsidized by the SMRC, making it a very affordable option. A grant of $20,000 from Wheatbelt NRM through the Australian Government to help fund the trials for three years meant information would be shared with the farming community. Wheatbelt NRM’s Georgie Troup said the trial was one of nine sustainable agriculture trials recently funded. Each trial examined innovative soil, cropping, grazing and agroforestry management practices that contributed to the farm bottom line, while also improving the health of soil, water and biodiversity resources. “The trial at Cadoux is a long term investment, by improving the amount of organic carbon in the soil, we can improve a number of soil functions that support plant productivity, such as nutrient cycling and the water holding capacity of sandy soils,” Georgie Troup said. “There are a number of soil constraints that farmers face, ranging from non-wetting issues to soil compaction, that affect the ability of plants to use nutrients in the soil. So far the Duli Group has run into several challenges, including trying to find the best way to spread the compost at a rate of five to ten tonnes to the hectare. “We’re using a multi spreader, but the compost is half the weight of lime so in one run you are empty,” Mike Kaljzic said. “We’re also limited on what soil type we can best use the compost, as there is no point spreading on highly acidic soils because the microbes won’t survive. Each trial site was given different seed and fertiliser treatments ranging from rock phosphate, granular MAP, Flexi-N and CalSap, plus pre and post emergent sprays. 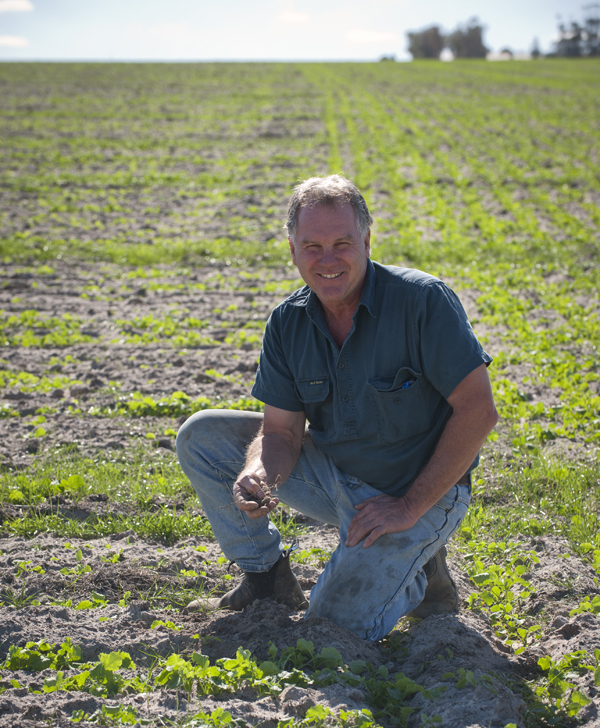 “These paddocks needed to be sown with fertiliser because we believe the compost alone won’t offer enough available nutrients to maintain yields at the moment,” Mike Kalajzic said. The different treatments will be closely monitored through the Wheatbelt NRM funded trials using extensive soil testing, plant pathology and the collection of yield data. “We’re not expecting anything to happen in the first year, what we’re aiming to do is make something economically justifiable that will prove to be a long term investment in our soils,” Mike Kalajzic said.